As true data-driven professionals, it should come as no surprise we are into caffeine and energy drinks. These come just after oxygen in our data scientist's survival toolbox. In this edition of Kalinax Insight Analytics, we are exploring the brand value of Red Bull across the globe, based on the number of searches made on Google for the last 1 year. It is the US where the greatest number of those searching "Red Bull" are based with 465 US searches per day on average. Germany comes slightly behind which makes it the country with the greatest number of Red Bull searches per capita in the world. Tableau notably generates greater interest in developed markets - Singapore, Italy, Belgium; and falls way behind QlikView in major developing geographies - namely India, Brazil and Argentina. Germany, Australia, France, Japan and Spain also made QlikView's Top 10 interest-generating countries globally. "Overall, QlikView generates more interest than Tableau across the Top 10 locations for each, however our data suggests that online ads for Tableau are 17% more expensive than QlikView ads, which could indicate lower QlikView margins. The fact that Tableau leads in developed regions further validates such a conclusion. QlikView enjoys times stronger interest in India and Brazil, while Tableau's key markets are the US and France", elaborates Pedro Pereira, our BI & Data Specialist who is in charge of Kalinax Insight Analytics. 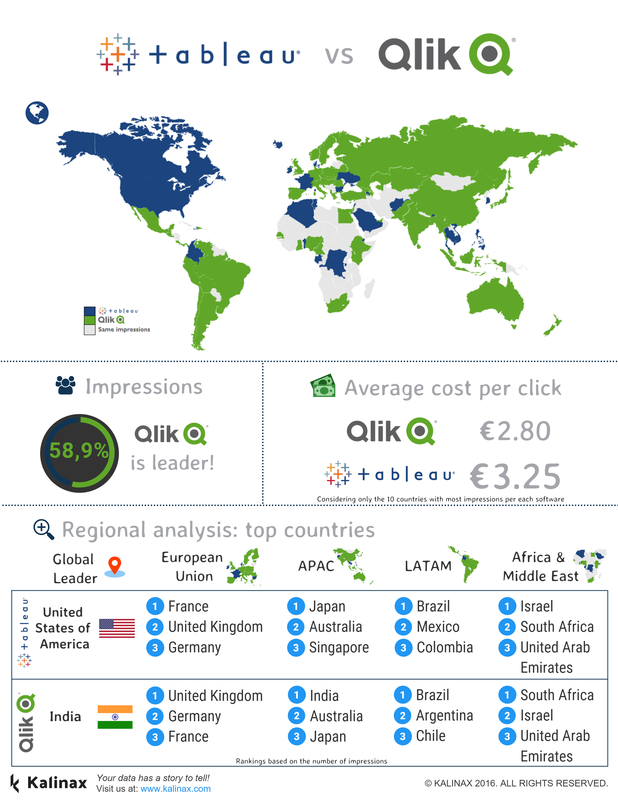 So if you were a business offering QlikView-related services or products, which countries should you run your ads in? We have looked closer in each region, to provide you with more relevant insights.